Your wedding is the one occasion in your lifetime where you can definitely go all out with a totally outlandish, extravagant, beautiful cake. Make the most of it! More than any other type of celebration cake, a wedding cake is there to be displayed, admired and photographed as a work of art before finally being devoured as it’s secondary function. It is a focal point of your wedding reception and should ideally draw your guests nearer to wonder at it. We first saw the work of Sugar Cakes at a local wedding show competition in February. We were so wowed by this showstopper piece that we began following them on social media and have been regularly amazed by their unique and unimaginably intricate designs ever since. 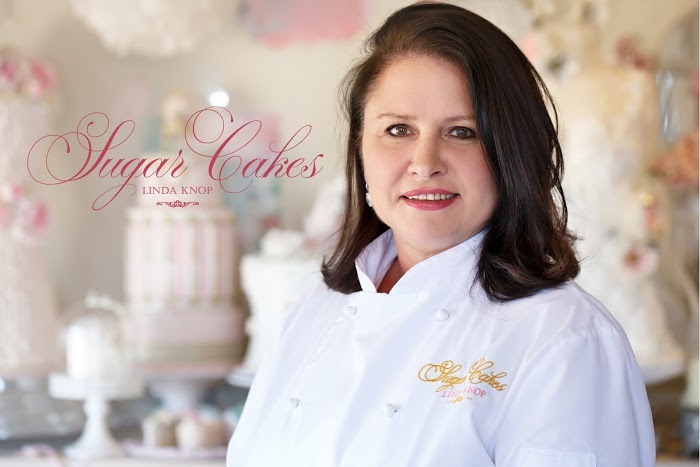 Meet Linda Knop, owner of Sugar Cakes and the lady behind the sensational sugar work. Sugar Cakes is a boutique cake shop where I create edible art pieces such as wedding cakes, other celebration cakes and designer cupcakes to suit every client’s theme. I also offer cake decorating classes on a weekly basis to local and international students. I have become an internationally recognised cake artist participating in cake collaborations overseas. My entry was one of four finalists in the world during May for a New York Cake Magazine competition. I am proud to say that Sugar Cakes has been featured in more than 30 South African publications as well as seven international magazines with an editorial feature. I’ve been doing this since 2010. There is a big range – anything from R1500 to R22000. In order to create the most beautiful wedding cake for each client, I only supply one wedding cake per day. On that basis I would say I’ve been involved in around 600 weddings. It’s very difficult to source specialized tools for my work in South Africa. I often have to order from abroad which can be costly. Absolutely everything, from the actual baking to creating and adding the very last handmade sugar flower, is done by me personally in my studio. I once created a particularly colourful wedding cake with roses in shades of pink, red and yellow, with parrot lilies, agapanthus and French hydrangeas. It was so vibrant and beautiful – very unique! Keep it simple but elegant. Cakes are generally expensive so opt for some dummy tiers. I create a spectacular cake regardless. This way you can still afford to opt for cake with height and really make a statement. Also keep the filling simple and not too rich – something like decadent dark chocolate or sweet vanilla is very popular. Sugar Cakes is an established local small business in the greater Cape Town area. My next goal is to focus more on specialized training for local and international cake artists with the emphasis on new trends and techniques. The cake decorating world advances on a daily basis so there are always new textures, skills and tools to learn and teach. More than anything, I want to keep on creating edible art. In the words of Coco Chanel, “in order to be irresistible, one must always be different”.